After Matthew’s murder in 1998, members of the Tectonic Theater Project in New York City traveled to Laramie, Wyoming, to interview residents about how the attack on Matt had affected the town. These transcripts were transformed into the play The Laramie Project, which tells the stories of real people who lived at the epicenter of one of the nation’s most heinous anti-gay hate crimes. The Laramie Project is one of the most frequently performed plays in America, as its messages still resonate with audiences today. The Matthew Shepard Foundation supports dozens of productions of The Laramie Project and its epilogue The Laramie Project: Ten Years Later every year across the country. Submit the accompanying form to connect with the Matthew Shepard Foundation about supporting your local production and download various resources. Please note: the download works best with Google Chrome. It’s the goal of the Matthew Shepard Foundation to create an environment where people are afforded an opportunity to discuss the play and its messages, the hate they encounter in their own lives, and how they can work collectively to build a more understanding and compassionate community. By clicking Send, the above School/Theatre Company agrees to credit The Matthew Shepard Foundation for these resources and support in the production program and (optionally) promotional materials such as posters. NOTE: video resources are ONLY for use by your cast/crew for research and education purposes, and for use during your production. They are only for non-profit educational use, and may not be shared in any form, including distribution to individual cast members unless they provide written consent to abide by these terms; nor for posting on the internet in any form, including institutional websites and social media. What are The Laramie Project and The Laramie Project: Ten Years Later about? The plays were created by Moises Kauffman and members of the Tectonic Theater Project in New York and explore the reaction and impacts of Matthew Shepard’s murder on the residents of Laramie, Wyoming. The Laramie Project premiered at The Ricketson Theatre at the Denver Center for the Performing Arts in February 2000 and was performed in New York City, as well as a November 2002 performance in Laramie, Wyoming. The Matthew Shepard Foundation’s Executive Director, Jason Marsden, wrote eloquently of the plays in his article “The Legacy of Matthew Shepard” for WyoHistory.org. “A literary and theatric legacy, meanwhile, came from a band of playwrights and performers from New York City who were moved by the unfolding story of how a town responds to tragedy, controversy and worldwide media attention. The Laramie Project is a gripping tour through the actual spoken words of Laramie people drawn from hundreds of hours of interviews to show the outrage, the sense of being unfairly singled out, the quiet hope for change among gay and lesbian residents and the sometimes callous behavior of journalists. With the possible exception of the ongoing Wyoming State Archives collection of oral histories from those at the crime’s epicenter, the play, which is still widely performed, is the fullest extant record of the feelings and impressions of those who lived the story. I'm interested in doing a production of The Laramie Project and/or The Laramie Project: Ten Years Later. How do I get started? Rights to the Laramie Project plays are facilitated through Dramatists Play Service. They will inform you if the rights are available to you, and the process of obtaining them. How can the Matthew Shepard Foundation help with my production? 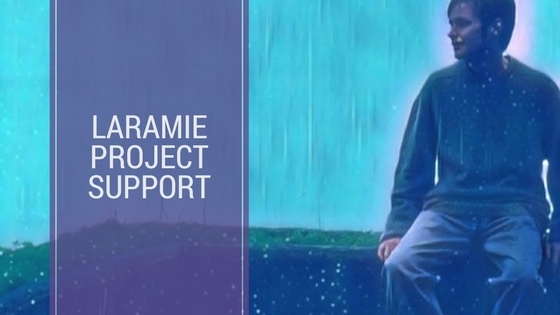 The Foundation has an entire archive of marketing and visual materials for schools and production companies looking to perform The Laramie Project. We now have a form you can fill out to receive these materials. Our Executive Director, Jason Marsden, is also available to answer questions or Skype-in for a talk-back session with the cast. To set up one of those sessions, please email media@matthewshepard.org and we’ll schedule it! Does the play depict a murder? No. The play is about the people of the town of Laramie and how they reacted to Matthew Shepard’s beating and murder. There is no violence depicted onstage. Does The Laramie Project promote homosexuality? No. Although often wrongly labeled “that gay play” by its detractors, The Laramie Project is not about homosexuality or even primarily about Matthew himself. Again, it’s about how the people of Laramie and the world reacted to the crime. As documentary theatre, it lays before the audience what happened in the case of Matthew’s murder and how the people of Laramie, and the world, responded. There are many differing viewpoints put forth in the play, and it is left to the individual to decide how they feel about what happened and about each of the individual characters. Is the play appropriate to for all audiences? Due to mature themes and language, many companies producing the play choose to include a disclaimer or warning that the subject matter may not be suitable for all ages. Can I edit the plays for length or content? The plays belong to Tectonic Theater Project and may not be altered in any form without the express permission of the authors. You may contact them at admin@tectonictheaterproject.org. Where is the fence where Matthew was found? The fence was taken down by the landowner not long after the murder, because so many people were trespassing on the land to come pay homage at the site. There are a number of differing accounts about the fate of the fence. Some say the pieces of wood were incorporated into other fences on the property, some think the section was moved whole to another location nearby, some say the wood is in a storehouse or barn somewhere. We probably will never know, but as Matt’s mother Judy says, for those who come out to pay their respects it’s not necessarily the fence itself but the sense of place that often is the most moving. A bench dedicated to Matthew’s memory and unveiled with the Shepards at the University of Wyoming is located on the east entranceway to the Arts & Sciences Classroom Building on campus in Laramie. Will Matt's murderers ever be released from prison? In short, no. In Wyoming, there is a distinction between life in prison and life without the possibility of parole or commutation. Russell Henderson pleaded guilty before his trial was to start in order to avoid the death penalty. He received two life sentences, for kidnapping and murder, to be served consecutively (one after the other) rather than concurrently (at the same time). This means he has virtually no chance for release. Aaron McKinney, who actually killed Matthew, was convicted at trial and before the sentencing phase of the trial his defense team reached an agreement with the prosecution and the Shepard family to take the death penalty off the table. McKinney was sentenced to two consecutive life terms with no possibility of parole. The idea was to end the case and avoid the endless appeals of a death penalty conviction, including the possibility either Henderson or McKinney might be released on a technicality. Additionally, the Shepards, especially for the sake of their other son Logan, wanted the killers to have no more publicity or voice, which the killers agreed to. However, they have broken that promise and given conflicting, self-serving interviews to the media.